The Pentax WG-1 is offer some nice improvements over its predecessors, with tougher "lifeproof" specifications, longer battery life, and additional LED macro lamps. At $349 or less, it offers a good bang for your buck in a competitive market niche. Read more in our Full Conclusion. Building off the success of their past "Lifeproof" W-series models, like the Optio W90, Pentax has created their most rugger camera yet with the introduction of the Optio WG-1 and WG-1 GPS. These models offer identical specifications, with the latter camera offering GPS functionality and different color options. Waterproof down to 33 feet, crushproof up to 220 pounds (100kgf kilogram-force), Coldproof to sub-freezing temps of 14°F (10° C), dustproof, and shockproof up to a 5 foot fall, the WG-1 is as tough as they come. Many of its other features have been carried over from the W90, including a 5x optical zoom lens, 2.7-inch LCD screen, and 720p HD video recording. Pentax has upped the resolution to 14-megapixels (from 12), and added two additional LED macro lights around the lens, giving you a total of five. 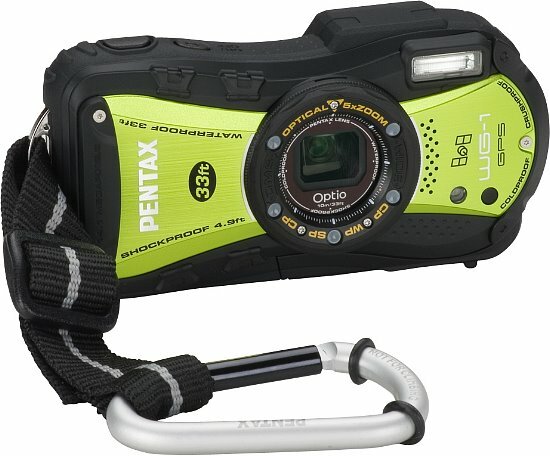 The Pentax Optio WG-1 is available in Black or Purple with a suggested retail price of $349.95 US, while the WG-1 GPS is offered in Black or Green/Yellow for about $399.95 US. See our buy boxes below for more accurate online pricing.